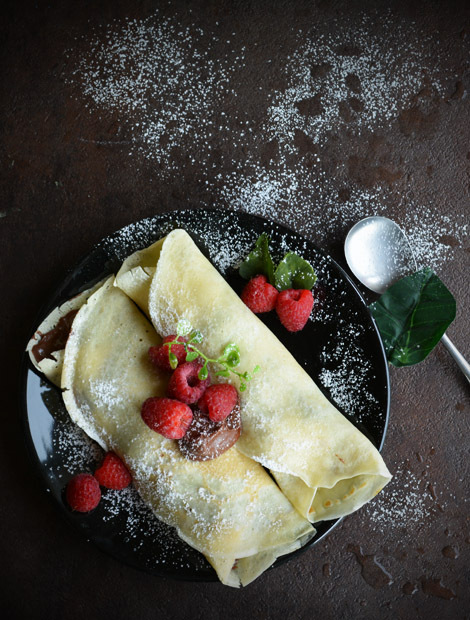 Raspberry crepe filled with Nutella recipe, a super way of including fresh fruits in kids food. Spreading Nutella over the crepe and fresh, cute little raspberries stuffing will definitely make the kiddos jump out of joy. Deciding the menu for the kids always an hectic task. If we ask their choices for the breakfast…I’m sure its just a neck breaking task. It just worsens, on their not..sooo…active days. Whatever you ask them, they immediately say No..and they have their own complaints towards every other dishes. We definitely know, there are few secret choices, which they never say No. Nutella, tops that secret list. There is also an secret formula to make children and mom happy. So, this Nutella filled raspberry crepe is one such recipe, which makes mom and the children happy. The ingredients and the process of making these crepes is very simple and easy. Variations can be made to this recipe are infinite, instead of nutella use peanut butter, cream cheese, jam or any of your favorite spread. Stuff fresh fruits which are seasonally available. You know I have already come up with a basic french crepe recipe, and another healthy quinoa crepe recipe, you may check for reference. You may also check another kids favorite carnival dish, Funnel cake recipe. If you want to make the crepe soft and tender, leave the prepared batter in refrigerator for about 30 minutes before use. To convert this recipe as a savory, spread coriander chutney, garlic chutney instead of Nutella. 1. In a mixing bowl, crack open an egg. And add all purpose flour, sugar, salt, melted butter and milk. Using whisk or blender combine everything together so that no lumps seen. Hint: Refrigerate the batter between 15 minutes to one hour to make the crepes more tender. 2. Heat skillet over the medium heat, and wait until it gets heated up. Pour half a cup of batter over the skillet. Lift and tilt the skillet gently so that the poured batter forms the shape of a flat circle. Cook it for about 1 to 2 minutes until the sides of the crepe slightly lifts up from the skillet. 3. Flip the crepe over the other side, gently using spatula. Cook it for the about 1 to 2 minutes or until it reaches desired texture(soft/crisp). 4. Transfer it to a serving plate. Spread 2 tbsp of Nutella evenly using a knife. If you are serving for children, be generous in adding Nutella according to their choice. 5. Arrange raspberries evenly to the half of crepe. Hint: Arranging them in half of the portion helps roll and hold the crepes easily. 6. Roll them gently and tightly so that the fruits should not fell apart. Repeat the process for the remaining batter. 7. Arrange rolled crepe in a serving plate, dust powdered sugar/confectioners sugar over the crepe. 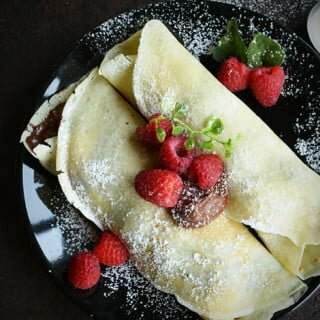 Serve raspberry crepe filled with Nutella with whipped cream topping or another spoonful of Nutella. In a mixing bowl, crack open an egg. And add all purpose flour, sugar, salt, melted butter and milk. Using whisk or blender combine everything together so that no lumps seen. Hint: Refrigerate the batter between 15 minutes to one hour to make the crepes more tender. Heat skillet over the medium heat, and wait until it gets heated up. Pour half a cup of batter over the skillet. Lift and tilt the skillet gently so that the poured batter forms the shape of a flat circle. Cook it for about 1 to 2 minutes until the sides of the crepe slightly lifts up from the skillet. Flip the crepe over the other side, gently using spatula. Cook it for the about 1 to 2 minutes or until it reaches desired texture(soft/crisp). Transfer it to a serving plate. Spread 2 tbsp of Nutella evenly using a knife. If you are serving for children, be generous in adding Nutella according to their choice. Arrange raspberries evenly to the half of crepe. Hint: Arranging them in half of the portion helps roll and hold the crepes easily. Roll them gently and tightly so that the fruits should not fell apart. Repeat the process for the remaining batter. Arrange rolled crepe in a serving plate, dust powdered sugar/confectioners sugar over the crepe. 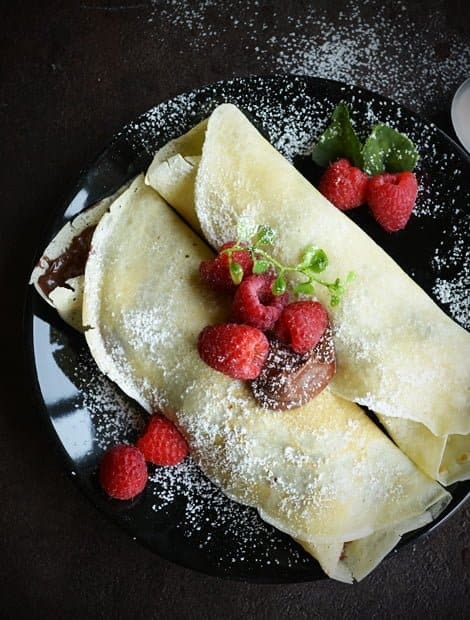 Serve raspberry crepe filled with Nutella with whipped cream topping or another spoonful of Nutella. These look amazing! I have yet to introduce my 3-year-old to crepes, but you’re right–he would love them!